A Period Is Questioned in the Declaration of Independence. Every Fourth of July, some Americans sit down to read the Declaration of Independence, reacquainting themselves with the nation’s founding charter exactly as it was signed by the Second Continental Congress in 1776. Or almost exactly? A scholar is now saying that the official transcript of the document produced by the National Archives and Records Administration contains a significant error — smack in the middle of the sentence beginning “We hold these truths to be self-evident,” no less. That errant spot of ink, she believes, makes a difference, contributing to what she calls a “routine but serious misunderstanding” of the document. 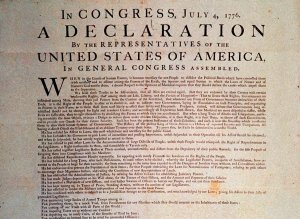 Correcting the punctuation, if indeed it is wrong, is unlikely to quell the never-ending debates about the deeper meaning of the Declaration of Independence. But scholars who have reviewed Ms. Allen’s research say she has raised a serious question. Ms. Allen first wondered about the period two years ago, while researching her book “Our Declaration: A Reading of the Declaration of Independence in Defense of Equality,” published last week by Liveright. The period does not appear on the other known versions produced with Congressional oversight in 1776, or for that matter in most major 20th-century scholarly books on the document. So what was it doing in the National Archives’ transcription? Ms. Allen wrote to the archives in 2012 raising the question, and received a response saying its researchers would look into the matter, followed by silence. And now the archives, after a meeting last month with Ms. Allen, says it is weighing changes to its online presentation of the Declaration of Independence. “We want to take advantage of this possible new discovery,” William A. Mayer, the archives’ executive for research services, said in an email. That parchment, created in late July 1776 and credited to the hand of Timothy Matlack, is visible to anyone. Last year, more than a million people lined up to see the document at the National Archives Museum in Washington, where it is kept in a bulletproof glass case filled with stabilizing argon gas that is lowered each evening into an underground vault. But that document has faded almost to the point of illegibility, leaving scholars to look to other versions from 1776 to determine the “original” text. The period does not appear in Jefferson’s so-called original rough draft (held in the Library of Congress), or in the broadside that Congress ordered from the Philadelphia printer John Dunlap on July 4. It also does not appear in the version that was copied into Congress’s official records, known as its “corrected journal,” in mid-July. Defenders of the period are not without ammunition. The mark does appear in some official and unofficial early printings, including the broadside that Congress commissioned from the Baltimore printer Mary Katherine Goddard in January 1777, for distribution to the states. Most fatefully, it also clearly appears on the 1823 copperplate created by the engraver William Stone to replicate the original parchment, which was already fading. The copperplate, which Stone took three years to create, has long been presumed to be a precise copy and has become the basis for most modern reproductions, including the one that has appeared every July 4 since 1922 in The New York Times. Mr. Mayer of the archives said it was testing the feasibility of doing new types of imaging, including hyperspectral imaging, through the document’s protective glass encasement. “We don’t yet know what’s possible,” he said. Such imaging may prove inconclusive — or, of course, prove Ms. Allen wrong. But so be it, she said.